Plexiform neurofibroma (PN), usually associated with neurofibromatosis type 1, is a benign peripheral nerve sheath tumor, which consists of multiple, twisted masses that involve and infiltrate multiple nerve fascicles or branches of major nerves. In general, PNs are managed conservatively with serial imaging studies, unless the tumor is easily resectable, without the risk of consequential neurological deficits. The potential for postoperative functional morbidity, the relatively high rate of local recurrence, and the difficulty in managing them surgically (as they are extensively infiltrative and highly vascularised), have left neurosurgeons reluctant to undertake resection of these leisons. To our knowledge, there has been only one case report of a plexiform neurofibroma of the bilateral brachial and lumbosacral plexuses, as observed in our patient. 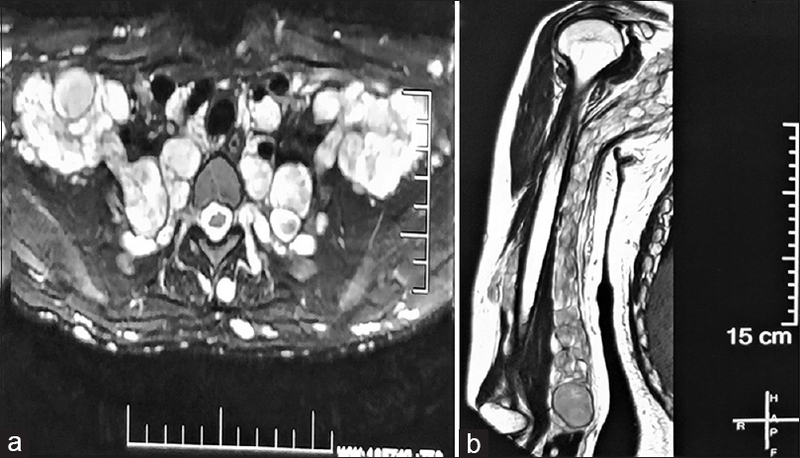 This paper describes a case of bilateral plexiform neurofibromas of the brachial and lumbosacral plexuses, with presentation of the clinical and radiological findings. An 18-year old female patient presented with a history of paresthesia and distal weakness of both upper and lower limb since childhood. 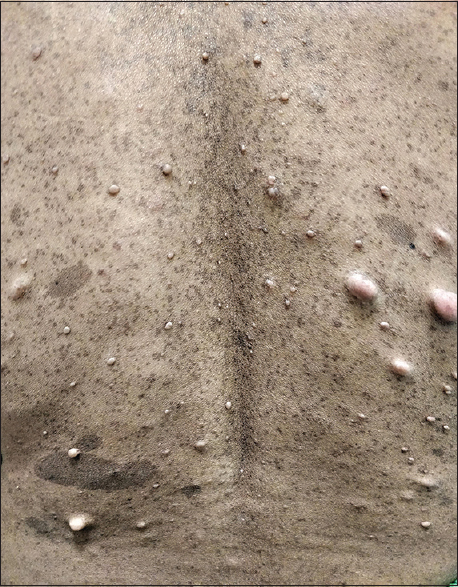 Physical examination revealed “Café au lait” spots on the patient's back, and cutaneous and subcutaneous neurofibromas seen over the extremities and back [Figure 1]. The neurological examination showed bilateral mild hand grip weakness and partial foot drop. There was no family history of neurocutaneous lesions. Brain magnetic resonance imaging (MRI) showed no other cranial nerve tumors. 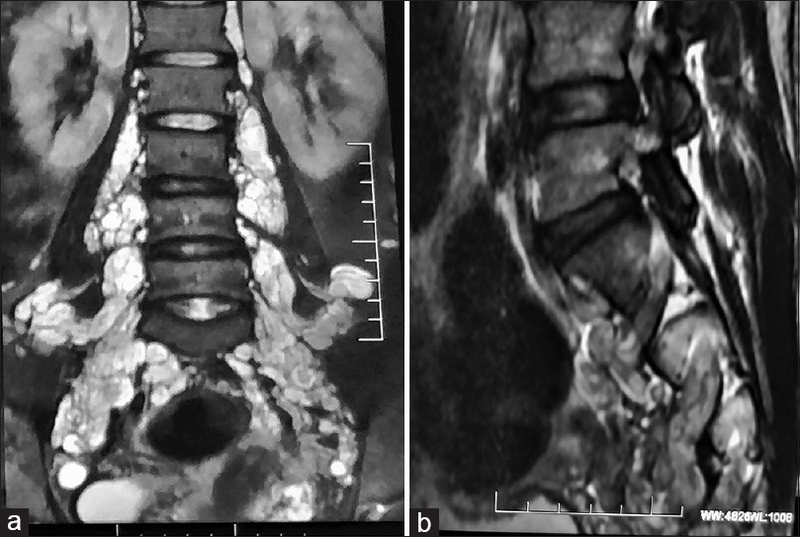 The MRI of the lesion showed a diffuse fusiform pattern of elongated, lobulated, soft tissue-intensity lesions along the course of all major plexuses of spinal cord and subcutaneous peripheral nerves. These included bilateral brachial and sacral plexuses to their visualised extents, giving a bag-of-worms like appearance. The lesions involved bilateral paravertebral spaces along the whole length of spine, with extension through the neural foramina on both sides. These lesions appeared iso- to intermediate signal intensity on T1 weighted (W) images, and heterogeneously hyperintense with a few small areas of hypointensity on T2 W images. On post-contrast scan, a near homogenous enhancement was noted. MRI of the brachial plexus revealed multiple, lobular, expansive tumors in the distribution of the brachial plexus bilaterally, extending to the anterior mediastinum as well as the adjacent parapharyngeal spaces on both sides, and invading the spinal canal [Figure 2] and [Figure 3]a. MRI images of the arms showed a well-defined tubular mass lesion along all the brachial plexus nerve roots (the median, ulnar and radial nerves) from the visualised axillary region upto the distal arm [Figure 3]b. The MRI of the lumbosacral plexus showed involvement of both the plexuses and suggested the extension over bilateral parasacral region and the paravertebral soft tissue. It als exhibited the presence of a tumor towards the lumbosacral neural foramens [Figure 4]. The radiological features were suggestive of plexiform neurofibromas involving bilateral brachial and lumbosacral plexuses. No surgery was undertaken, considering that the potential morbidity from attempting surgical resection in such extensive lesions far outweighs the potential clinical benefit, given her mild symptoms. During the follow-up period, the patient reported an improvement in her paresthesia without worsening of neurological deficit. Thus, the management decision was to continue conservative management. The management of plexiform neurofibromas has traditionally been surgical; surgical resection is, however, usually difficult due to the large and infiltrative nature of the lesions. The management depends on the location and growth pattern of the lesions. Symptomatic cases may require surgical management, but the decision for undertaking surgery and the surgical approach to be adopted is often quite difficult to formalize because PNs occupy a large spinal and extraspinal region. It has been advised that surgical procedures should be performed only if complete or nearly complete resection seems possible along with preservation of neurological function. The PNs are not radiosensitive and only limited benefit has been seen with chemotherapy due to their slow growth rate. In the present case, complete tumour resection was impossible due to the involvement of all major plexuses of spinal cord and peripheral nerves. The treatment of such PNs in patients with NF-1 consists of a regular follow-up involving serial clinical examinations and neuroimaging studies.,, This policy was followed in the present case. There is a paucity of epidemiological data and extensive narrative of the disease in the literature, so studies are required to know about the disease more accurately. To the best of our knowledge, we could find only one case report of a plexiform neurofibroma of bilateral brachial and lumbosacral plexuses, as observed in our patient. In our case, radiological imaging features established a greater tumour burden than the patient's symptoms would suggest, with extensive infiltration of all major plexuses of the spinal cord and the subcutaneous peripheral nerves. In view of the prolonged duration of symptoms, an improvement in the neurological function after any surgical intervention was not expected. In addition, because the tumour was too large and extensive to excise, we refrained from performing surgery. The future of successful management of such extensive PNs may lie in the development of effective nonsurgical modalities. Al-Otibi M, Rutka JT. Neurosurgical implications of neurofibromatosis Type I in children. Neurosurg Focus 2006;20(1):E2. 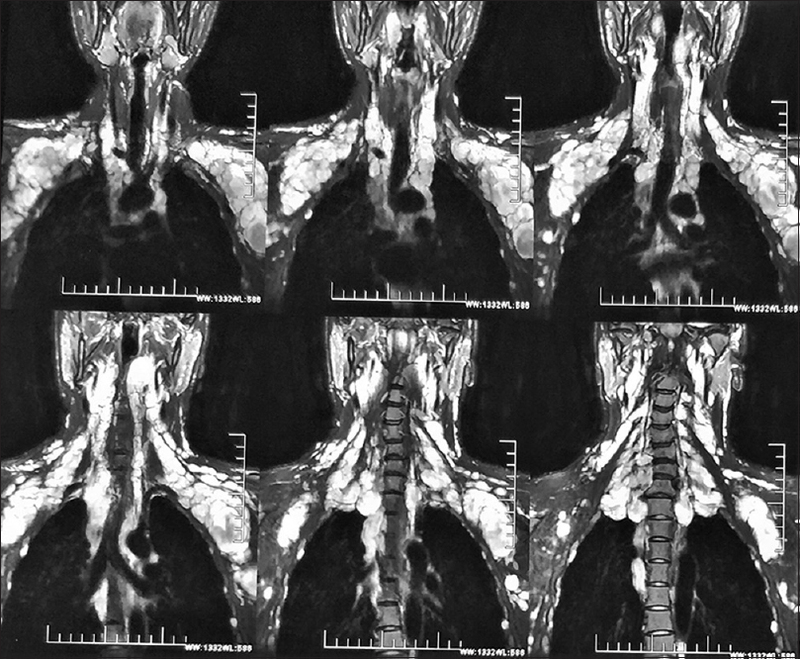 Souza FH, Dabdoub CB, Bernardino SN, Silveira EN, Litvin S, Azevedo-Filho H. Bilateral plexiform neurofibromas of the brachial and lumbosacral plexuses. Arq Neuropsiquiatr 2013;71:128-30. Wise JB, Cryer JE, Belasco JB, Jacobs I, Elden L. Management of head and neck plexiform neurofibromas in pediatric patients with neurofibromatosis type 1. Arch Otolaryngol Head Neck Surg 2005;131:712-8. Greinwald J, Derkay CS, Schechter GL. Management of massive head and neck neurofibromas in children. Am J Otolaryngol 1996;17:136-42. Serletis D, Parkin P, Bouffet E, Shroff M, Drake JM, Rutka JT. Massive plexiform neurofibromas in childhood: Natural history and management issues. J Neurosurg 2007;106 (5 Suppl):363-7.